The best conversations start with Interactions. Interactions Intelligent Virtual Assistant enables effortless conversations through voice or text. So you can offer more choices, more self-service, and brand consistency across channels to achieve customer care excellence. To be truly omnichannel, you need more than channel choice. Interactions Intelligent Virtual Assistant maintains context and persistence across channels. So switching from phone to web to SMS is a snap, and conversations can pick up wherever they left off. No repetition or frustration. You only get one chance to get it right. That’s why we use a blend of Artificial Intelligence (AI) and human understanding to enable businesses and consumers to engage in productive conversations. So your customers can communicate naturally, get what they need and be on their way. Interactions Intelligent Virtual Assistants enable you to create a truly personal and efficient experience for your customers. With integrations to business applications and customer data, you can deliver a highly personalized user experience that’s aware of any recent interactions your customers have had. Your customers compare you to the best brands they interact with. Delight them with self-service that works. Our Intelligent Virtual Assistant (IVA) lets you truly engage with your customers on the channels of their choice, across their customer journey. Customer experience can make or break your brand. Our IVA makes customer experience efficient and effortless, helping brands improve customer satisfaction and NPS. Our enterprise clients are consistently recognized as CX leaders by J.D. Power, Forbes, and others. You shouldn’t have to choose between quality and savings. Our IVA handles complex, repetitive parts of the transaction, reducing average handle time and improving first call resolution. Moreover, our IVA is proven at scale to handle normal volumes as well as seasonal peaks, eliminating OPEX due to seasonal hiring and training. Agent churn is one of the biggest challenges faced by contact centers. The tedious nature of work makes agents bored, disengaged and burnt-out over time. The IVA works hand in hand with your agents to complete tasks, making them feel valued and empowered. The IVA takes over repetitive, mundane transactions such as data gathering, password resets, payment processing and more, leaving your agents to concentrate on revenue-generating tasks that require agent expertise like upsell. This improves agent productivity and value. Our IVA is a fully managed cloud-based solution. From initial design to implementation and from continuous training and improvement, to security and compliance, we’ve got you covered. With our deployment expertise, you can speed up time-to-market and realize your ROI quicker. We’re the front door to millions of great customer interactions. To survive in today’s hyper-competitive, customer-first market, every business must become a customer experience-first business. Your customers demand speed, convenience and conversational experience on every channel they use. 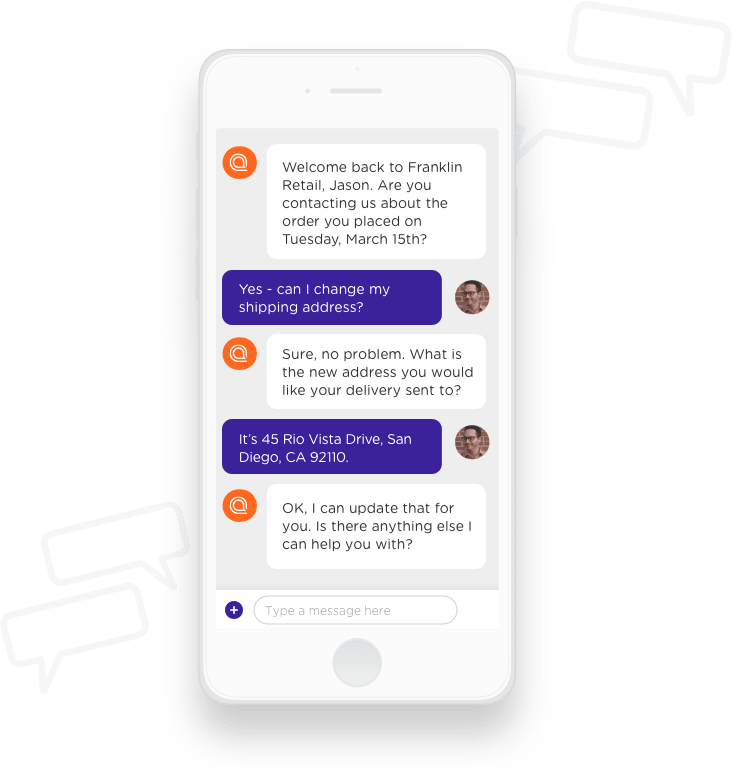 Conversational AI can help you get there. How does Interactions Intelligent Virtual Assistant seamlessly combines artificial intelligence and human understanding? Watch this video to learn about our patented Adaptive Understanding technology and the benefit it brings automate to customer service transactions.